This project represents the last phase of additions to an existing community college campus. The site was located at the southwestern edge of the existing college buildings against a curving access road. 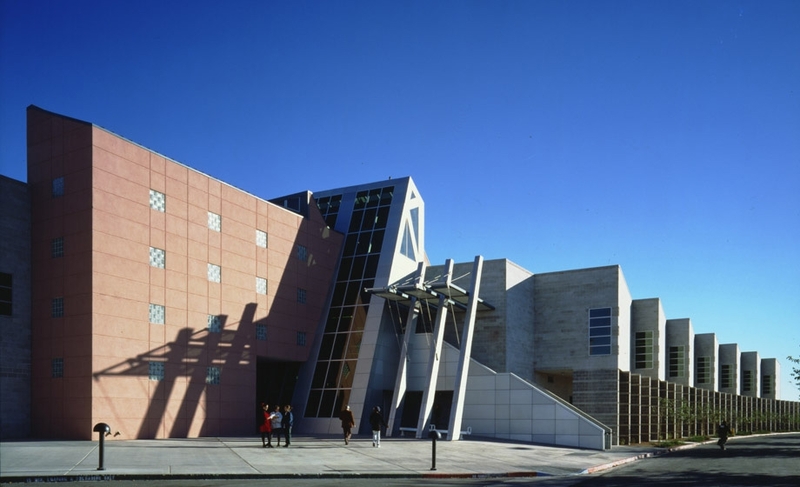 The design of the classroom building was intended to serve as a counterbalance to the completed performing arts center to the north, defining the western edge of the campus and its main entrance. The design of this building, along with numerous previous additions and renovations, was intended to establish a needed identity for the college and improve its visual image. Conceptually, the building is seen as a series of layers representing the process of learning and discovery. Along the outer edge of the building, the western façade is rendered opaque and uniform with common masonry walls. As one moves laterally through the building, materials and structure are revealed terminating in the simple corrugated panels of the building’s east face. The building is transformed radically from an expression of formal rationalism to an architecture of lightness and discovery. The classroom building contains the college’s culinary arts department and restaurant, interactive computer learning center, faculty offices and general classroom space. The design is organized along a curving axis that responds to the landscaped edge of the site. This major axis is intersected by a grid that is orthogonal to the existing college buildings, defining the link between new and old portions of the site. The buildings are connected by an elevated walkway. The walkway both connects with and is an extension of the new building’s wedge-shaped lobby. The lobby’s aluminum clad atrium and north facing sloped glazing denote the new building’s main entrance.